A simple 10-day moving average of the daily advance-decline net, probably the first indicator a stock market technician learns, can be used as a trading tool, if objectively defined rules are created for its use. He also says that you can think of a moving average as an automated trend line. A 20-year veteran of technical analysis, Jeffrey wrote "How You Can Find High-Probability Trading Opportunities Using Moving Averages." Let’s begin with the most commonly-used moving averages among market technicians: the 50- and 200-day simple moving averages. These two trend lines often serve as areas of resistance or support. For example, the chart below shows the circled areas where the 200-period SMA provided resistance in an April-to-May, 2008 upward move in the DJIA (top circle on the heavy black line), and the 50-period SMA provided support (lower circle on the blue line). 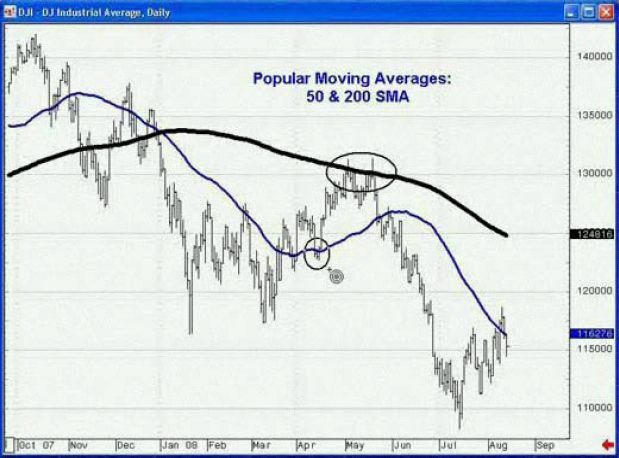 Let’s look at another widely used simple moving average which works equally well in commodities, currencies, and stocks: the 13-period SMA. In the sugar chart below, prices crossed the line (marked by the short, red vertical line), and that cross led to a substantial rally. 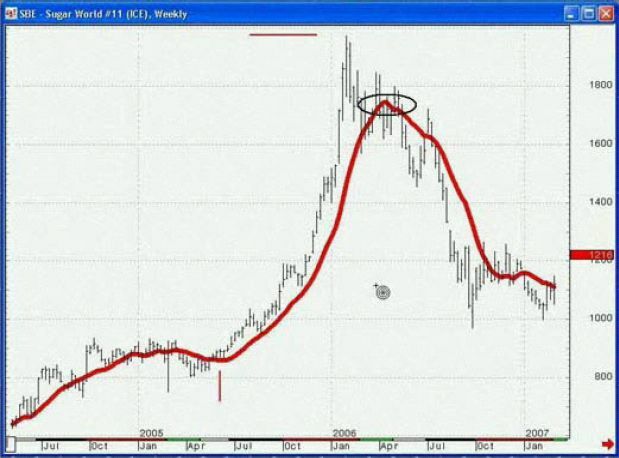 This chart also shows a whipsaw in the market, which is circled. Another popular moving average setting that many people work with is the 13- and the 26-period moving averages in tandem. The chart of Johnson and Johnson shows a crossover system using a 13-week and a 26-week simple moving average of the close. Obviously, the number 26 is two times 13. During this four-year period, the range in this stock was a little over $20.00, which is not much price appreciation. This dual moving average system worked well in a relatively bad market by identifying a number of buyside and sellside trading opportunities. You can read the first two chapters of this eBook FREE for a limited time. Jeffrey’s insights are all about helping you become a better trader. Remember, the first two eBook chapters are FREE, so take advantage of this limited-time offer. This article was syndicated by Elliott Wave International and was originally published under the headline Spot High-Confidence Trading Opportunities Using Moving Averages. EWI is the world’s largest market forecasting firm. Its staff of full-time analysts led by Chartered Market Technician Robert Prechter provides 24-hour-a-day market analysis to institutional and private investors around the world.